Vera Brosgol spins a chilling tale of teenage self-acceptance and friendship in this gripping graphic novel. Anya Borzakovskaya is strong young woman who is struggling to find her place in a world that pressures girls to fit certain expectations. As an immigrant to the U.S., she fears that her Russian accent and heritage have cast her as an outsider. She rejects her family’s food, fearing that she’s too fat, works hard to lose her accent, lies about her last name, and constantly worries about coming across as “fobby” – fresh off the boat. Her only friend is a tough Irish girl whom she cuts class to smoke with. The boy that she thinks she’s in love with is currently dating the prettiest girl in school. After an incident in the park, she befriends a ghost girl and it seems that life begins to improve. As the friendship between Anya and the ghost progresses, things begin to unravel and Anya realizes that nothing is as it appears. In the end, Anya realizes that the very things she rejected are now the things she must preserve by defeating a demonic spirit. 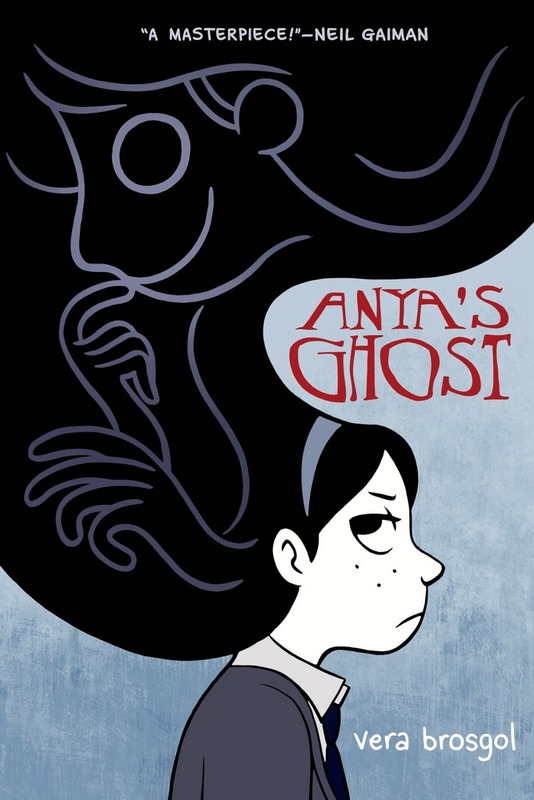 Anya’s Ghost has all of the elements of a young adult novel with its brutally honest portrayal of the trauma of life for a teen immigrant and of a fairy tale that reminds us that good conquers evil only when we accept who we are and hold our family dear. The gray-scale artwork lends a dark humor to the novel. The images are visually pleasing and successfully enhance the storyline, driving the reader forward to see what happens next. Brosgol expertly uses her imagery to provide varying perspectives and to draw her reader deep into Anya’s world. The artwork and the narrative pair beautifully to create a page-turning experience for the reader. This text could be paired with Hansel & Gretel (Neil Gaiman & Lorenzo Mattotti, 2014) and The Sleeper and the Spindle (Neil Gaiman & Chris Riddell, 2014) to examine the elements of fairy tale, author’s purpose, varying perspectives, and the use of visuals and media to influence a message. It could also be paired with The Perks of Being a Wallflower (Stephen Chbosky, 1999) and The Outsiders (S. E. Hinton, 1967) to examine the elements of novel and social themes that are common issues for teenagers such as identity, social expectations, or relationships. Another possibility are books on immigrant experiences. Vera Brosgol is an award-winning author who lives in Portland, Oregon. Anya’s authentic voice and experience are natural extensions of Brosgol’s own experience as a first-generation immigrant from Moscow, Russia who spent most of her life in the United States. According to an interview with Brosgol, the big difference between herself and Anya was that Brosgol was a good student in school.